In order to appease you all for my absence last month (just one post in February! Where on earth was I? 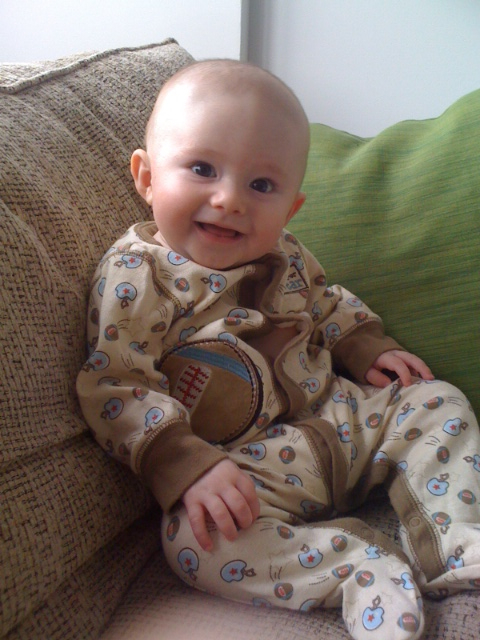 ), I'm posting a photo of our son who is quickly becoming quite the little man. He's cute, he's happy, and he's a hell of a lot of work. But life is good in the FFLibrarian household and we've got big news churning over here. As many of you know, my husband and I moved to Brooklyn 1.5 years ago after spending seven years in Boulder, Colorado...and now we're moving yet again. My husband is an academic, hence our mildly nomadic life, though I'm thinking this next move might stick for awhile. We won't know where we're going for another 24 hours or so until all job offers have been made and weighed and reweighed, but I can safely say that we will soon be living in the south. Quite the whirlwind to go from the mountain west to NYC to southern living. Glad you all have been along for the ride and it should once again keep my summer a bit nutty as I balance el bebe, moving, and fantasy football. If I thought moving across the country with two cats was a challenge, can't wait to see what it's like with a 10 month old in the mix. Speaking of this summer, fingers crossed that we actually have an NFL season in 2011. I can't even go there, can't comprehend that level of fantasy tragedy. For the latest, tune into ProFootballTalk.com's NFL ownership joins the party too. More news is sure to come shortly. In the meantime, Indy just hosted the combine so of course there's a bit of combine news to scope out - recaps from Football Outsiders should do the trick if you're in the mood for commentary on players, coaches, and more. Combine Notes: Day One, Day Two and Day Three. For some other observations from the combine and a look ahead to draft day (less than 2 months away! ), take a look at Razzball.com's Quarterback Primer: Draft Day. Players Worth Tracking looks at potential breakout stars for 2011 and makes an effort to dig a bit deeper to bring you some names you aren't seeing elsewhere. PFF.com is putting together a ranking of free agents including Offensive Interior Linemen, Offensive Tackles, 4-3 Outside Linebackers/Inside Linebackers, Defensive Tackles and 3-4 Ends...oh and more standard positions like WRs and QBs. Can you name a mascot to give us a hint? We would like to thank you for maintaining such a reputable blog. We know that it takes time, effort and commitment to keep such a blog and as such, we have added your blog as one of the top Fantasy Football Blogs.